This movie has been one of my favorites since I first saw it in eighth grade, laughing over an absurdly large bucket of popcorn with my best friend at the time. 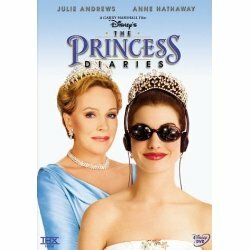 I can see why a lot of fans of The Princess Diaries might not like this film. It’s aimed at a slightly younger audience, and vaguely encompasses the plots of the first three books in the series. I love it because it’s a flirty and fun twist on the original story, but still maintains Mia’s ever relatable awkwardness. Also, if you’ve read previous Adaptation Corner posts, you know that for me, fidelity is not the most important thing to me in an adaptation. One thing I don’t understand is why this film takes place in San Francisco instead of New York. I don’t mind, since the scenery is quite pretty, I just don’t understand why the change was made. The feel of Mia and Helen’s apartment is, however, very similar to the book, in my opinion. The soundtrack serves as a fun and youthful backdrop, making Mia feel like another teen with the same problems as other kids. The film preserves the basic idea of the series, as well as some of the major plot points of the first three books. I don’t think they could have pulled the film off without some of these, and I want you to discover them on your own, so I’ll just say that if you’ve read the book and seen this movie, you’ll probably know what I’m talking about. I think Anne Hathaway does an excellent job of bringing these moments to life. While reading about Mia’s worries over her body image can prove entertaining, I think Hathaway does an excellent job of physical comedy to the role, such as in gym class, which appeals to a broader audience than a discussion about cup size. Some of the characters have been modified, particularly Grandmere, who is intimidating and rude in the books, yet sweet and eager to get to know her grandmother in this version of the story. I think this change may have occurred because some might have speculated that a nasty grandparent would draw younger audiences away, but also because Juile Andrews has been cast for the part, and I think it’s hard to imagine her as being so mean. Instead she teaches lessons with a firm hand, but also tries to relate to her granddaughter. Michael is also somewhat different, but I don’t think it’s his character himself such as the fact that his feelings for more obvious are more obvious from the outset of the film than that of the book. Plus Robert Schwartzman, the actor who plays him, is easy on the eyes. If you’re looking for a loyal adaptation or a serious movie, I don’t recommend watching The Princess Diaries. However, this is a fun and empowering movie which is great for diverse audiences. If you want to see this story portrayed in a youthful and comedic light, I highly recommend picking this film up. My daughter and I love this movie and watch it often when we want a girls movie night. Neither of us had read the books first though, so that probably helped. I really enjoyed this!! This is a great feature. I love the PD books and both movies. A couple things I noted though- The change to SF from NYC was because Garry Marshall didn't want to leave his family so he moved production there. And it's interesting that you note some similarities to PDs 2 and 3 because actually they were only basing it on the first book since that was the only volume out at the time of production and there was no guarantee there would be more than 1 book. Disney bought the rights before publication, I believe. Just some little tidbits. I know way too much about Meg Cabot and her books, lol. I am a twenty something librarian. I read a wide variety of books, particularly fiction, YA fiction, classics and fantasy. TLC BOOK TOURS presents... The Austen Playbook by Lucy Parker! Which Should Be Installed in your house? Sunday Post/What Are You Reading? Attention! Dear Readers… I am flying the coop! In My Mailbox (27) and What Are You Reading? In My Mailbox (43) and What Are You Reading? In My Mailbox (44) and What Are You Reading?